Genpact is conducting walkin interview in Hyderabad and Bangalore locations on 7th to 9th May 2018. Therefore contenders who have experience in BPO field must grab this chance. In addition to that whose dream is to get a job in Call Center must read the entire article to know the unique details. Most of all candidates are in confusion to know the exact information about Genpact Walkin. The Genpact company is ready to hire the capable individuals. Therefore we suggest the competitors make sure that meet the eligibility criteria and attend for Genpact Walkin Interview on specified dates. 1.5 How To Apply For Genpact Walkin? Job seeking aspirants must read the provided details and also have an overview of the tabular form. Furthermore, in the tabular form, we have furnished the details about Company name, educational qualification details, experience details, job location, job role, compensation details, etc. Hence contenders refer all the details and practice well to get a job in Genpact. Therefore the team of Freshersnow providing Genpact placement papers and Genpact interview questions for better preparation. While preparing for Genpact Walkin add the provided test papers in your preparation. Therefore, if you want to know more updates scroll down this page. Most of all the freshers and experienced individuals are right now busy in finding the latest Jobs in Hyderabad And Bangalore. But no one can find the accurate info related to their profile. Therefore for those people, we have tried our level best and collected the Freshers Jobs from different sources and furnished on this page. Thus with the help of this blog, aspirants will get the latest job openings across India. Hence candidates have to face Genpact selection process by participating various levels. Therefore if candidates got shortlisted, they could get an excellent pay. Genpact Walkin For Banking process voice profile. Candidates should know the Hindi Language. Any Graduate candidates can attend directly at mentioned venue. Any Graduate with Technical support experience and Customer Support experience would be preferred. Contenders must have good communication skills. One-sided cab facility will be provided for selected employees. Candidate should be willing to relocate. Hiring Rounds: Only two rounds of interview. The Genpact company is a global professional services firm that makes business transformation real. We think with design, dream in digital, and solve problems with data and analytics. From New York to New Delhi more than 20 countries. Genpact began in 1997 as a business unit within General Electric. Bain Capital became Genpact’s largest shareholder in November 2012. Since December 31, 2005, the company Genpact have expanded from 19,000+ employees. And annual revenues of US$491.90 million to 77,000+ employees. Genpact has the end-to-end expertise to connect every dot, reimagine every process, and reinvent companies’ ways of working. In January 2005, Genpact became an independent company to bring our process expertise and unique DNA in Lean management to clients beyond GE. Obsess over operations and also focus on the details – all 78,000+ of us. (SMS Building) Bellandur Petrol bunk bus stop-560103. There is no parking within the campus. What Should I Carry For Genpact Walkin? Any valid ID Proof such as Aadhar, PAN, Driving License, Passport, etc. Xerox copies of educational certificates. 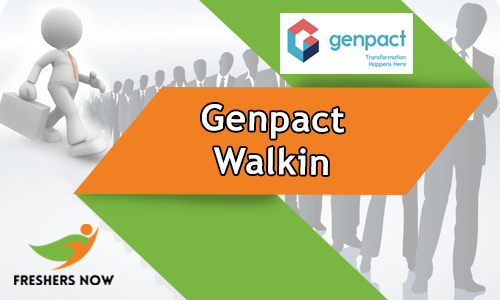 How To Apply For Genpact Walkin? Therefore contenders who want to appear for the Genpact Careers they have to read the entire post. By referring this article job seekers can know the walkin date, time and venue and also necessary certificate details. Moreover, Genpact Jobs is helpful for the people who are in job search. Finally, in conclusion, we are saying that practice hard to get success. It seems that this webpage may be helpful for all graduate fresher and experienced candidates. To know more job updates such as Walkins, Walkin across India, Freshers jobs, IT Jobs, etc. bookmark our page Freshersnow.